Broadway Moonlight. Emily Trueblood. 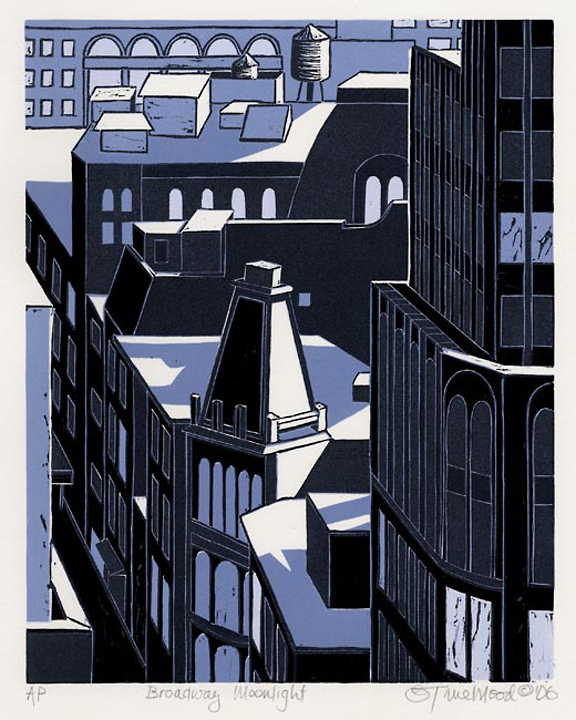 Three-block linocut, 2006. Edition 50. Image size 10 x 8″ (255 x 203 mm). LINK. 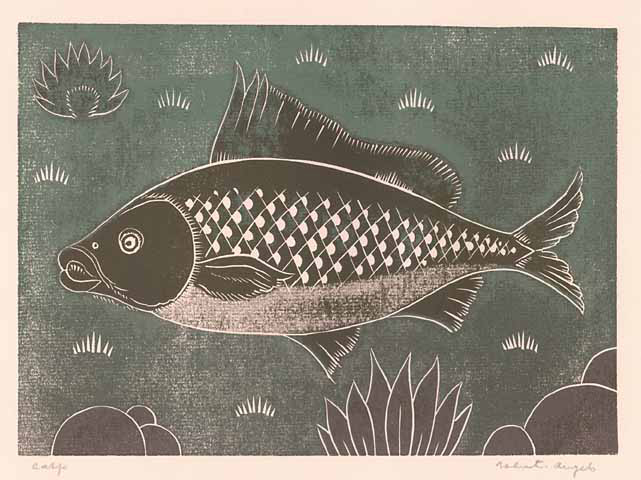 Linocut printmaking is a form of relief printing, using a linoleum block as a matrix. The artist sketches a composition on a block of linoleum, and then cuts away pieces from the surface with a chisel or gouge, leaving a raised area which will receive the ink. A roller is then used to apply ink to this raised surface, and the image is transferred to paper with a press or by hand burnishing and rubbing. Since the recessed cut-away areas do not receive ink, they appear white on the printed image. The method matches that of a woodblock, but since the linoleum block does not have a directional wood grain, the surface of the print will have less texture and the artist has more freedom in the line work. The linoleum takes all types of lines, but it is suited to large designs with high contrasting tints. If an artist wants to incorporate multiple colors into the linocut, each color will be printed with its own carved linoleum block. The print is created by printing a sheet of paper with each of the blocks in turn, using a strict method of registration to avoid overlapping or misplacement. The greater the complexity, the greater the rate of failed or imperfect impressions. Below are several of the linocuts we have in our 20th century and contemporary inventory. 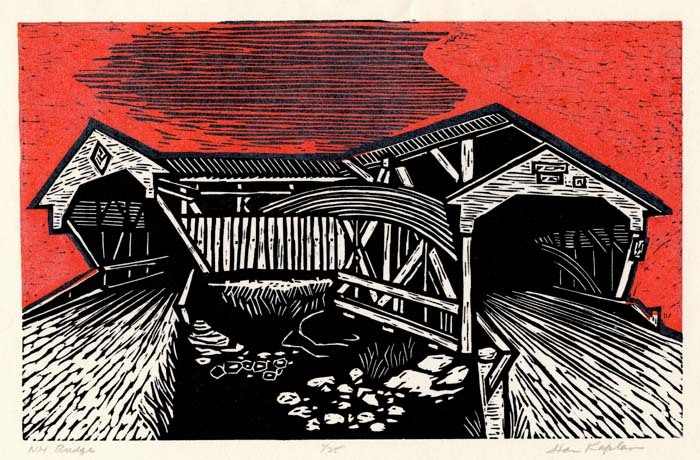 Stop by our Georgetown gallery to see the prints in person, and look at more linocuts! Sea View. Stanley Kaplan. Linocut, 2005. Edition 25. Image size 8 1/4 x 17 5/8″ (206 x 345 mm). LINK. Carp. Valenti Angelo. Color linocut, undated. Image size 6 1/4 x 8 3/4″ (152 x 223 mm). LINK. N. H. Bridge. Stanley Kaplan. 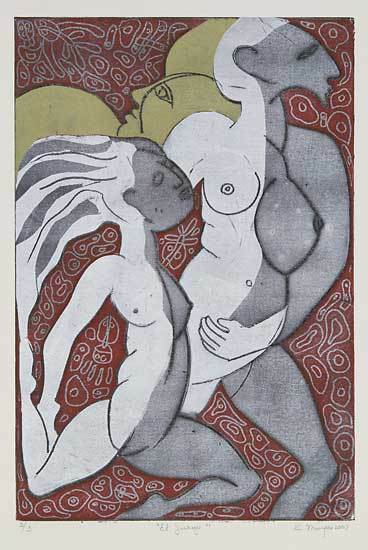 Color linocut, 1997. Edition 25. 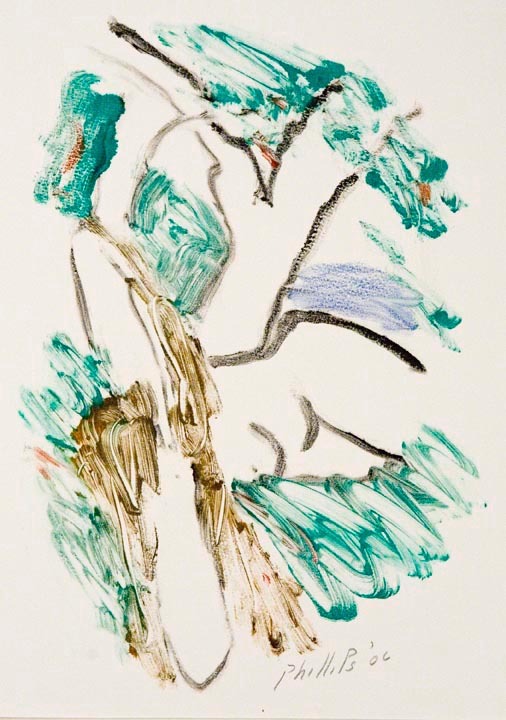 Image size 8 1/4 x 13″ (210 x 330 mm). LINK. Studio Scene w/Doves. Matt Phillips. 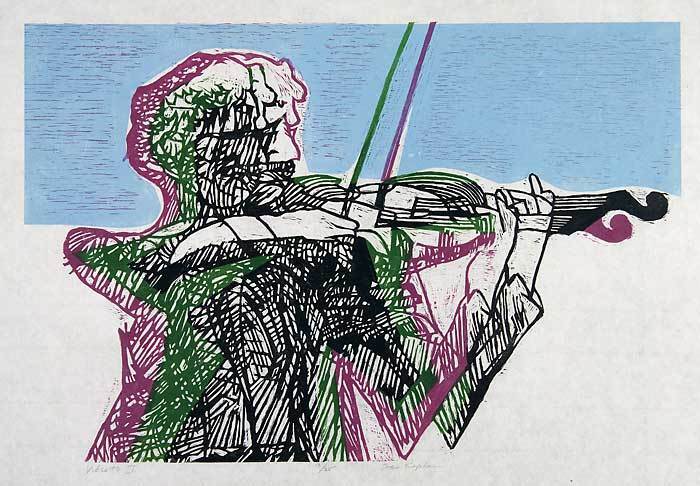 Linocut, 1976. Image size 22 x 15 3/4″ (560 x 400 mm). LINK. El Juego. Karima Muyaes. Color reduction linocut, 2007. Edition 3. Image size 17 3/4 x 11 7/8″ (450 x 303 mm). LINK. Division Street. Richard Sloat. 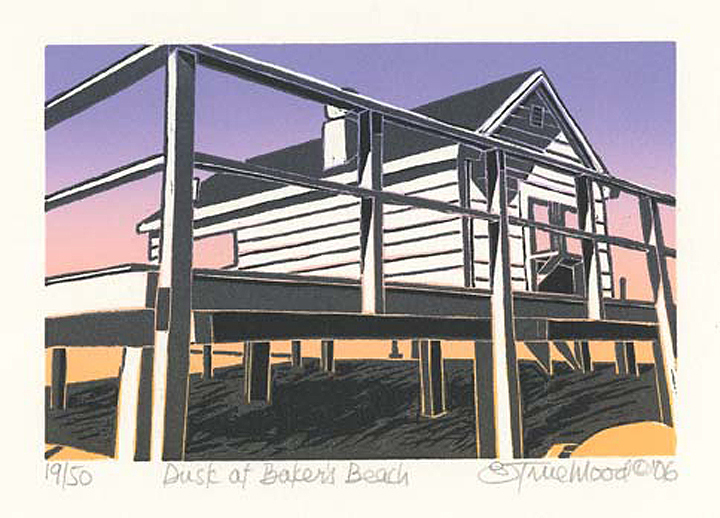 Three-color linocut, 1995. Edition 50. Image size 7 1/8 x 13 7/8″ (180 x 354 mm). LINK. Still Life with Top Hat & Dove in Cage. Matt Phillips. 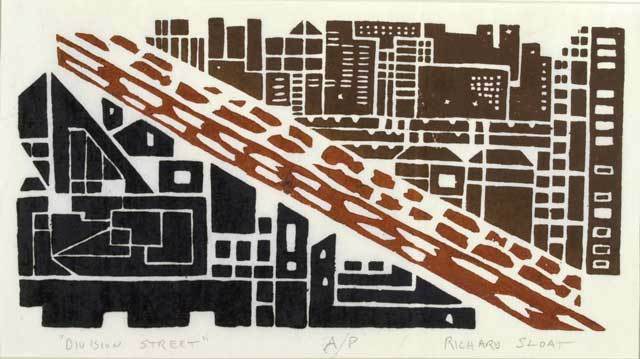 Linocut, 1978. Image size 9 15/16 x 7 15/16″ (252 x 202 mm). LINK. Vibrato II. Stanley Kaplan. Color linocut, 2006. Edition 25. Image size 12 x 18″ (305 x 457 mm). LINK. Dusk at Baker’s Beach. [Massachusetts.] Emily Trueblood. Three-block linocut, 2006. Edition 50. Image size 3 7/8 x 5 7/8″ (98 x 150 mm). LINK. 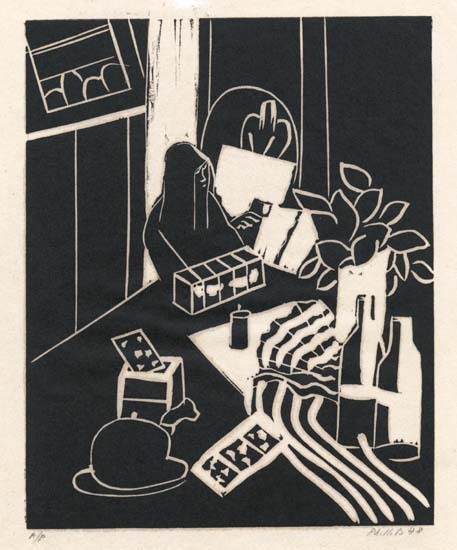 Today we have a new P/P post, featuring market scenes, by contemporary artist Ellen Nathan Singer and 20th century printmaker Matt Phillips. These artists both use dramatic black lines to add depth and dimension to their prints, resulting in two strong, graphic prints. 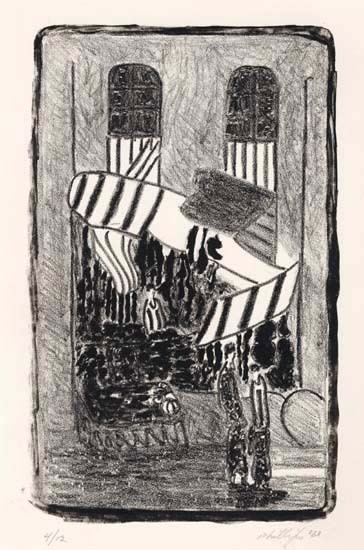 Phillips plays with diagonal shapes and lines to mimic the awnings of French street vendors, while Singer’s shapely barrels, boxes, and vases fill her engaging scene. We hope you enjoy this paring! As always, both prints are available for purchase, and can also be viewed in person at our Georgetown gallery, or online at our website. 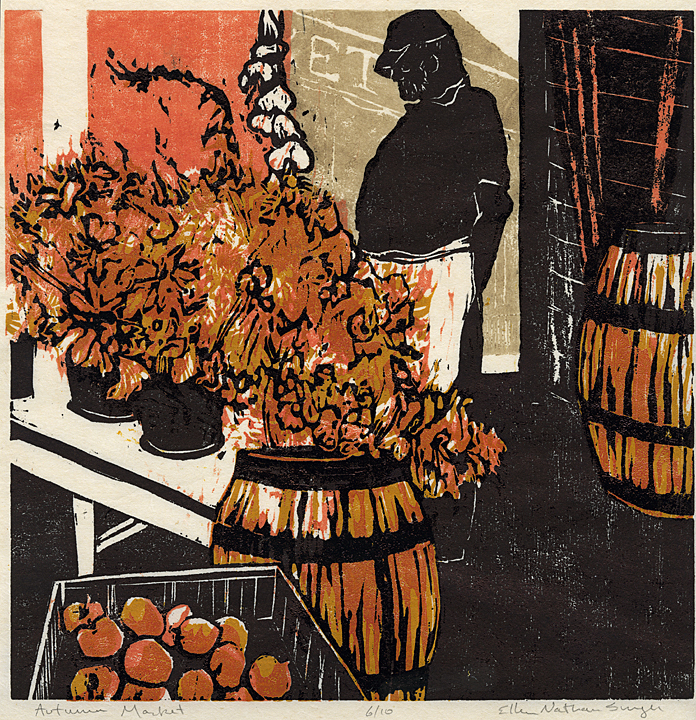 Singer’s print, Autumn Market, is currently in our Winter Contemporary Show, on view until February 9th. Image on Left: Market Scene. By Matt Phillips. Lithograph, 1963. Edition of 12. Image on Right: Autumn Market. By Ellen Nathan Singer. 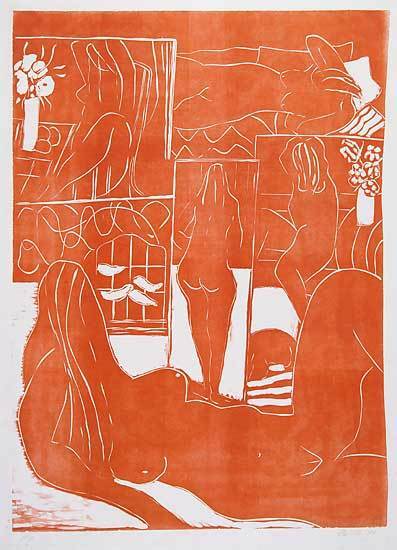 Woodcut, 2009. Edition of 10.